In this chapter, I introduce my understanding of Ihsan. I revisit the sacred sources of Ihsan, unpack them and define Ihsan beyond the classical understanding as a spiritual state. I envision Ihsan as a complex philosophy that includes an epistemology, the spiritual act of witnessing God, as political forgiveness, as anti-identity politics (Fanaa), as pursuit of excellence, as self-criticism and as steadfastness. Ihsan is presented as a process of perfection and as mystical composure in times of adversity. 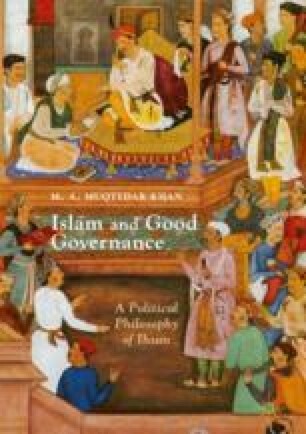 My rendition of Ihsan in this chapter allows me to reassemble the unpacked components as a political philosophy of good governance. Every aspect of Ihsan unveiled is based on the Quran and tradition. I am not a member of any Sufi order nor have I pledged any allegiance to any Sufi saint or scholar and so I am under no obligation to restrain my critical and rational faculties and I am not beholden to anyone else’s vision. There are no unsubstantiated claims to knowledge, or gnosis in this book. Even when I write about mystical knowledge, I remain within the realm of reason and do not claim to advance any insight that is beyond the scope of rational arguments or empirical, historical or discursive analysis.